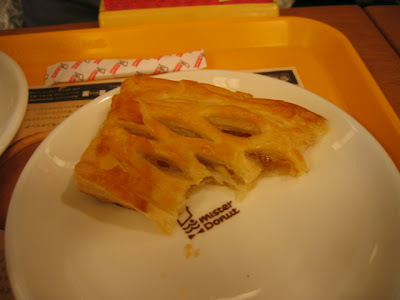 Sarah Cooks: Japan 2007: MISTER DONUT!!! Before we got to Germany and all their berliners and quarkinis, we were in Japan. And there was Mister Donut. Sarah: OH MY GOD THERE'S A MISTER DONUT NEAR OUR HOTEL!!! Mattcha flavoured "Pon de Lion" donut, cafe au lait. Forgive my schoolgirl excitement. The first time I went to Japan, it was as an excited 15-year old on a school trip. I fell in love with Doraemon, Japanese high school clubs, and Mister Donut. On this trip, as a still-excited 23-year old, I took many trips down memory lane and visited misutaa donatsu many times. It's been around for ages, and is very popular in Japan. I daresay it's better than Krispy Kreme, (gasp!) and totally different from those German donuts that I love so much. 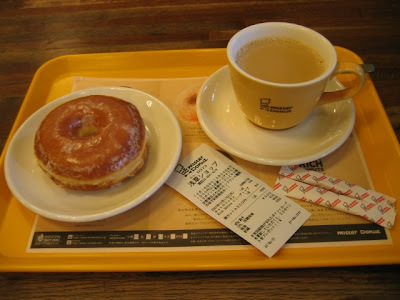 Whereas the German style donuts are larger and more substantial, usually covered in a blanket of sugar, Mister Donut donuts are light, smooth, sweet pieces of fluff, that are eaten in the merest of moments. Apple Pie. 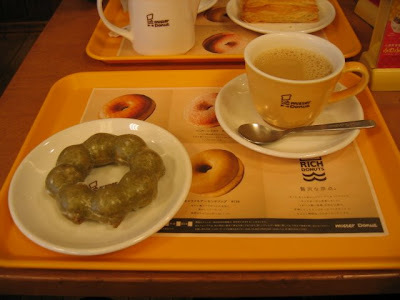 Mister Donut is not a one trick pony. Honey Glazed Donut, Cafe au Lait.